Over the years we have visited the Castel Romano designer outlet in Rome on many occasions and as can be seen from the comments and queries we’ve received, there’s been many questions asked about how to get to Castel Romano from Rome city centre. There is a daily shuttle service that leaves from near the via Marsala exit of Rome Termini station, but one thing to be aware of is that the shuttle arrangements and departure location do change slightly every now and then. On our latest visit (September 2015), we found that the Castel Romano shuttle is now being operated by a local sightseeing company. They use the black branded Castel Romano bus, but if you’re planning to take the Castel Romano shuttle, don’t be surprised if there are changes in arrangements. The main thing is that the shuttles do run and that approaching the departure time you will see others waiting for the bus. Via Marsala near the Termini end is being re-laid and as a result, the old ticket stand (picture to the right) is no longer there. The pickup point for the Castel Romano bus is now at number 71 via Marsala, which is on the Termini side of the road. From the via Marsala exit of Termini Station, walk to number 71. You may not see any sign there for the Castel Romano bus. When it arrives, it will pull into whatever parking space there is near 71. You can buy your bus ticket from the attendant on the bus. The Castel Romano complex has been undergoing some expansion and there is more development happening there. When we visited at the end of September 2015, we had to re-orient ourselves. During our few hours there I managed to buy some nice Moreschi boots whereas Tony scored with very nice Hugo Boss jackets and other items. If your hotel is in the vicinity of the Vatican, you can now catch the Castel Romano outlet bus that departs from Piazza Risorgimento. For more information see HERE. The return fares are Euro 15 (as at September 2015) per person. The journey takes about 45 minutes and you’re dropped off right at the outlet entrance. The shuttle ticket entitles you to a Privilege Card for the day which gives you a further 10% discount at certain shops. This however does not apply to items that are “on promotion” or “on sale”. The Castel Romano shuttle bus certainly is a much easier way to get to the outlet and the return trip is just as easy as the bus will be at the same spot where you are dropped off on arrival. Apart from the cost being half of that being charged by other providers, you also have more time at the outlet as there are a number of departure times from Castel Romano back to the city. If you prefer the convenience of being picked up from your Rome hotel, ask the concierge to ring +39 06 37350810 or +39 329 4317686 the day before your shopping trip to Castel Romano Designer Outlet, or in any event no later than 11 am on the day of the shopping trip. The cost of this service is 25 euros per person for a return ticket. To book this service call Castel Romano on +39 06 3234705 before 4 pm on the day before your shopping trip to the outlet. The cost of this service is 21 euros per person for a round trip ticket. Elizabeth, thanks for your feedback. Hope you found some nice high heels! Thank you very much for the very useful information! I am going to Rome with friends and would love to visit the outlet village! Should be awesome! Vladimir, thanks for your feedback. We’ve had someone else just come back from Castel Romano and she enjoyed her shopping. Have a great holiday and hope you and your friends enjoy the day out at Castel Romano. I want to go Castel Romano Designer Outlet at 23.July.2010. I will use Shuttle Bus Service from Rome Termini Station. Please tell me a ticket sales office. I will be staying in a hotel near Termini Station. 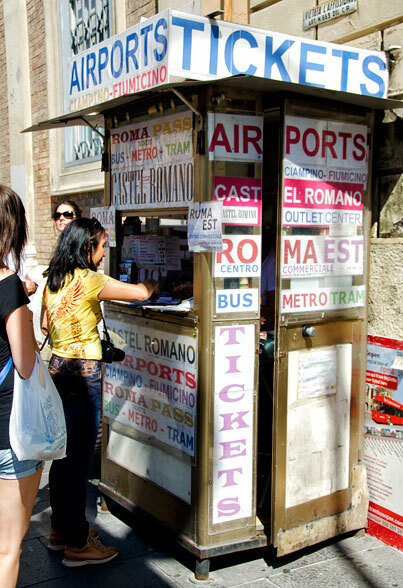 The ticket seller is at the Castel Romano bus-stop and you won’t have problems finding him. In fact, he will probably find you once you arrive at the bus-stop. In the our post below on Getting to Castel Romano, look for the big red bus – our ticket seller on that day was the guy in the stripe shirt. Have fun at Castel Romano. Thank you very much for the kindly answered. I can enjoy Castel Romano! Is it easy to get the ticket? Or I need to buy it in advance? Do you have on-line procedure to buy the ticket? You do not have to buy your shuttle ticket in advance. When you arrive at the Castel Romano bus-stop you pay cash to the ticket seller who is on the look-out for people wanting to go to the outlet. The post below gives departure times. Hi there, I was there as a tourist from Glasgow on Sun 12 June 2011. Apologies if this has already been answered somewhere else down the thread but you cannot by your ticket on the bus. When I was in the queue actually waiting for the bus the gf and I noticed that the majority of the queue were holding some sort of ticket and figured that it must be a bus ticket. Anyway when the bus pulled up the bus guy got off and said a ticket WAS required and pointed us to a shabby booth about 100 yards away on the other side of the street (still on Maresla). It was not obvious in the slightest. needless to say that when word went through the queue there was a stampede down the street towards the booth by a lot of people without tickets who were in fear of now missing the bus. The guy right enough did say he’d wait. Anyway that was my observation. If you know any different I would be interested to hear. Thanks for your update on buying tickets for the Castel Romano bus. No one else has mentioned it to me so far. It doesn’t surprise me at all that they’ve changed the system and not put up a sign to advise shoppers. When we first went in search of the bus stop, the sign was about three blocks away at the old stop. The old ticket system worked very well for shoppers and I wonder why they’ve changed it. I’m also wondering if this ‘shabby booth’ is yet another temporary measure. By the way, have they changed the bus to black, as I was told by Castel Romano? Hope you and the gf did find something nice at Castel Romano. 12 euro per person? ?is that a round trip? ?or one way only?? Zaldy, as my post indicates, “return fares are Euro 12….”, i.e. round trip. If rates have changed, please drop me a line. The rate stays the same – 12 euros for the return trip. In summer the last bus goes at 9 p.m. instead of 8 p.m.
Karina, thanks for your update. Hope you found something nice at the outlet. Are the outlets open on Saturdays? Sundays? Yes Castel Romano is open Monday to Sunday. If you intend shopping till late, you can still use the Shuttle Bus, which is much cheaper at 6 Euros per person. No reservation is required. 20:00 (In summer, the last service is at 20:30 and in any case the centre closes at 21:00). Thanks alot! This was really helpful! Please tell me what are the shuttle schedule to the Castel Romano outlet ? We travelled to Castel Romano on the 6th of May 2011 with the shuttle bus that leaves from Piazza Risorgimento. This is an alternative to Termini station way to go the the outlet mall. The bus from Piazza Risorgimento to Castel Romano leaves at 09:30, 12:00 and 14:30. Ticket price is 12 Euro round trip. Travelling from Piazza Risorgimento can be more convenient for those who stay close to Vatican. The bus stops where all tourist buses stop, at the beginning of the Vatican museum wall. It comes just couple of minutes before departure so please do not worry too much if you do not find it at its place in advance. I was also looking for a red bus as on the picture on this page, in fact all shuttle buses I saw in Castel Romano are brown. Buongiorno! Thank you for your instructions; I would like to offer a minor update? FEB12, one now takes a _right_ (not left) from the metro exit approx 200 feet. The bus driver will be holding a sign “CASTEL ROMANO”; they will direct you to the “shady booth” that says “TICKETS” on the awning – other side of Via Marghera. And tickets are $13 round trip. Grazie! Thanks for your update. Can you please advise if the Castel Romano bus is black or red? I’ve heard of both versions. The post has been updated with your information. Thanks again. need some advice. will be in rome around June. need info on factory outlets (gucci, LV, prada……). CK, below link takes you to Castel Romano brands directory. Gucci used to be there (I’ve been in the store a few times), but it doesn’t seem to have its own shop now. I’ve emailed Castel Romano and when I get a reply I’ll let you know. CK, I’ve had a response from Castel Romano and they advised that Gucci, Prada and LV are no longer at the outlet. GFs have to be indulged. It’s the key to a successful relationship! And if you don’t like Rome, there are also outlets in Florence, Serravalle, Veneto, Naples and Fidenza! Hi, I plan to go this mid Nov, will there be any chance to the opening and closing timing. Thanks. Castel Romano is open from 09:00 am to 21:00 in summer and usually in the winter months they close a little earlier. They will announce the winter hours later, so I suggest you check their website in October. I’m sorry to hear that your intended Castel Romano trip did not eventuate. Thanks for sharing your experience which I hope is only a rare occurence. Whenever I’ve been to Castel Romano we have always taken the bus from Termini. I actually may be going there in a couple of weeks and will mention your bad experience. Hi Helen, It was very smooth to find ticket box and the shuttle in front of Pharmcia, the shuttle is still same color as described by you, both me and my wife appreciate very much. Thanks a lot for your accurate instruction, we also had good time in Castel Romano. Hi Lin, Thank you for your feedback and I’m glad that you and your wife enjoyed shopping at Castel Romano. If you are ever going to Venice, there’s a great outlet there as well. May I take this opportunity to wish you and your wife all the best for the holiday season and may 2013 be a year of more travels for you. in in which place can we found the bus station from Castel Romano to Roma ? The bus stop for your return trip from Castel Romano to Roma is the same spot where you get off on your forward trip from Roma to Castel Romano. Hi! was just there to catch the shuttle from termini- no longer have the ticket box, we bought our tickets in the tickets counter shop aft being approached by one of the men on the streets selling city tour tickets and he brought us to his shop. Thanks Sabrina for your update. Can you clarify for me which “tickets counter shop” you’re referring to and which shop you were brought to by this man? Hi Helen, i was there today at the 51/53 via Marsala at 2.50pm. But couldn’t see any shutter bus till 3.30pm ): May i know it is at the Termini Station side or opp Termini Station right infront of a hotel? Your reply will deeply help. 51/53 via Marsala is on the Termini Station side. Note that the departures to Castel Romano are at 10:00 am, 12:30 and 3:00 pm. They may be a little late due to Rome’s chaotic traffic. I suggest you try catching the 12:30 pm, but get there a few minutes before time. Buongiorno, e complimenti per il sito pieno di informazioni. Hi.can u pls tell me if the Shuttle bus goes also on Sundays n the timings.thank u.